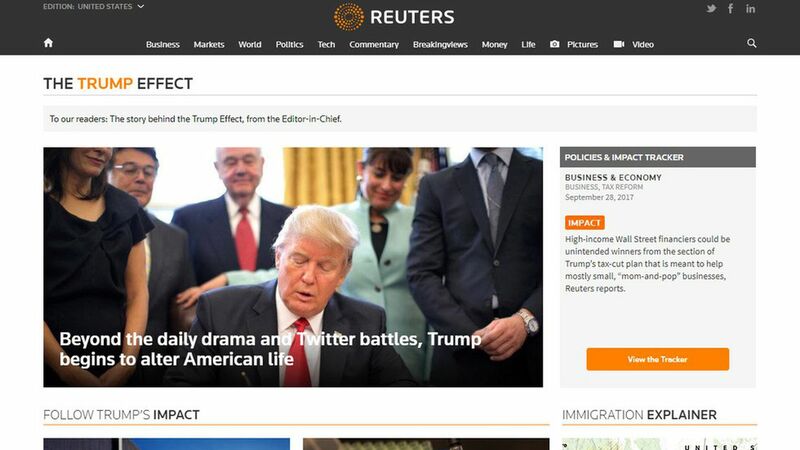 Reuters adds new show, section dedicated to "The Trump Effect"
Reuters is launching a new digital and TV feature centered around the latest impact that the Trump administration is having on people communities and businesses around the country. "The Trump Effect: Tracking the Impact of the President's Policies," is a new editorial section tied to politics that will show how Trump's speeches, tweets and rhetoric affect the world, as well as his policies. Why it matters: Reuters Editor-in-Chief Steve Adler tells Axios, "Our goal with the Trump Effect is to present the real-world impact of Trump administration policies, thereby moving beyond the daily political infighting that dominates much of the discussion of the presidency. We've built this site to screen out noise and focus on substance, not flash."